Control your Nest the way you should. Thermo Today does what you want. Simple. 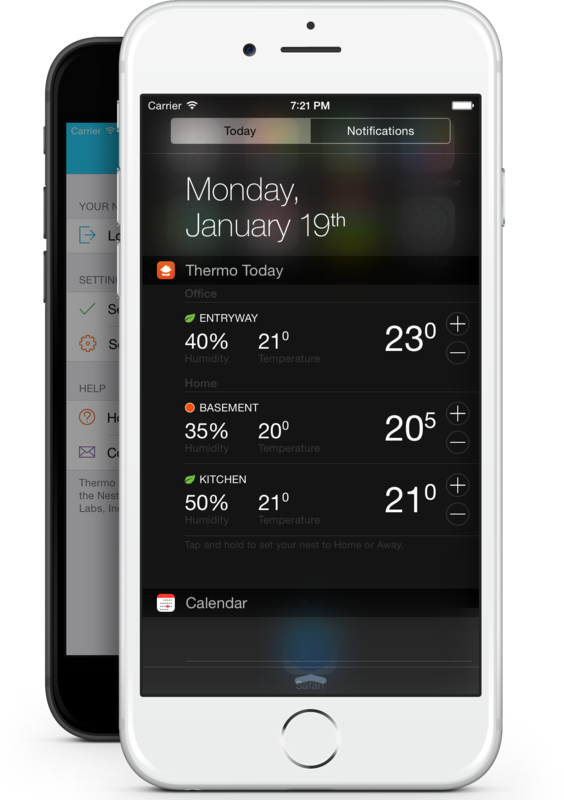 Just swipe down your notification center, and you're ready to go. Prefer Fahrenheit over Celcius? Thermo Today uses the scale you want. Switch between Home and Away? No need to fire up your Nest app! Stay healthy! Check your House's humidity with a swipe. Got a Nest at home and in the office? Thermo Today got your back: No need to switch! Got multiple Nests? Thermo Today supports multiple devices. Again, no need to switch! Thermo Today fills the missing link. Thermo Today fills the missing link between you and your Nest. It's intuitive and fast. Just swipe and go! Reliable and secure by using Nest's official SDK. ©2015 Xonay Media, All Rights Reserved. Nest™ and the Nest leaf logo, are trademarks licensed by Nest Labs, Inc.